The wait for the new Range Rover is almost over. Our new spy shots show the lighter, greener car almost completely naked, save for a few remaining streaks of dazzle-camouflage. We've also received some new photos of the Range Rover sporting a two-tone paint job, just like its little Evoque brother. Seeing such minimal disguise signifies only one thing: the fresh Rangey has been cleared for unveiling within a couple of months. Another Range Rover scoop? Not exactly well-disguised, is it? No - but the camo strip-tease has kept motoring junkies hooked on this story, wondering just how Land Rover will restyle their 4x4 icon for the next decade. 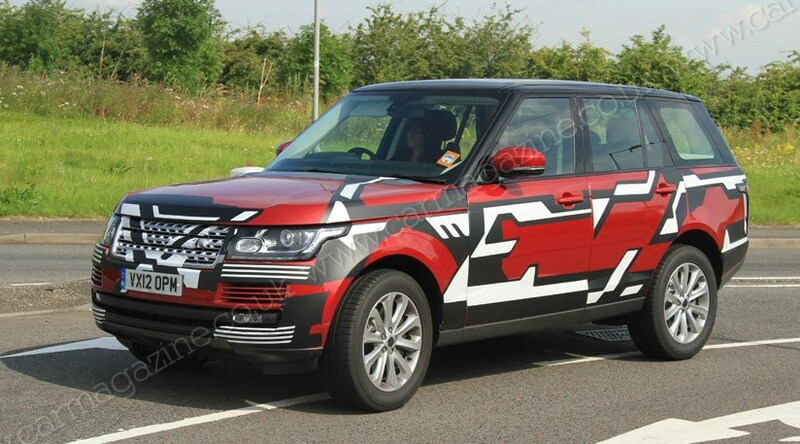 These spy shots show the wraparound headlights - clearly inspired by the Evoque - totally unmasked for the first time. At last, the grille design doesn't leave much to the imagination either. The rear light clusters mirror their frontal counterparts by cutting into the car's flanks. Those pesky zebra stripes can't hide the car's familiar proportions. The metal/glasshouse relationship looks to have been preserved from previous Range Rovers, maintaining its classic design DNA. Any more new Range Rover news? Yes - it's not just racking up the testing miles in the UK. CAR reader James Silk spotted a couple of cladded examples undergoing hot-weather testing in Death Valley, California, and sent us his own spy shots of the new SUV alongside two Jaguar XF sidekicks. This sparked a debate in CAR headquarters - could it be the first chassis tests of the Jaguar SUV/crossover; a car the company wants to expand its range? The truth is slightly less explosive: sources said the XFs were mere support vehicles. What's the inside track on the 2012 Rangey's spec? Despite similar dimensions to the outgoing model, the new Range Rover has been on a serious diet. Aluminium-intensive construction should reduce the current car's weight by around 30%, pitching the L405 Range Rover around the two-tonne mark. It's in with a shout of winning slimmer of the year. As before, V6 and V8 turbodiesel engines will be the spine of the European range, with Jaguar-sourced petrol powerplants concentrated on the US and Middle East markets. A hybrid version will join the family in 2014, and like its conventionally propelled sisters, will be strictly four-wheel-drive only.